With the digital realm providing such inestimable opportunities, time and again I come back to the question of how to maximize the potential of a digital project. The practicalities of research necessitate limits, which usually take the form of a logically defined scope (time period, event, geographic area, demographic, etc.). But the medium of digital methods allows us to move well beyond these quasi-reductionist approaches and thus begs two questions: when is the rejection of established scholarly approaches correct? And, how can the digital humanities promote such changes while still promoting its own disciplinary integration over its supposed uniqueness? One way to achieve this, I suggest, is to re-examine the idea of “multimodal” project design: that we plan all our scholarly projects to not just multiple ends, but in multiple modes. I’m not going to pretend this is new for it’s not – public historians in particular have done much to advance the reach and style of critical thinking and engagement outside the academy in really interesting ways. To be clear, the issue isn’t one of the rarity or infrequency of such design, but rather location and evaluation. Without meaning to denigrate our professional training, as Ph.D students much of the guidance we receive – which is very helpful – is at the behest of a tenure system that frequently runs the risk of embedding community-centered knowledge rather than developing society-focused participation. Sneakbox “Lesley” at the Independence Seaport Museum, Philadelphia, PA. 2017. The boat was the recent subject of the “Studies in American Material Culture” M.A. course at Temple University. 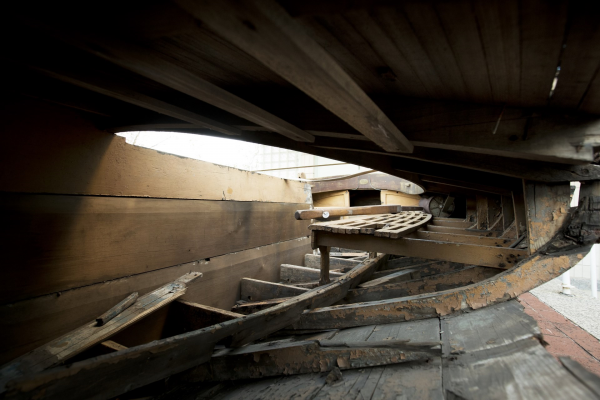 Boatbuilding is an excellent example of the risk of craftmanship. Photo by Ryan Brandenberg, Temple University. Knowledge fortification is a big problem and one that, in general terms, digital tools have been pretty good at solving. But the problem remains that for many historians “digital” is a prefix denoting difference. Part of this issue, I think, is that the modes in which we work – academic, pedagogical, administrative, etc. – all tend be delimited and anchored by institutions, editors, or bureaucracies. This has benefits, but also standardizes yardsticks of quality and produces highly refined goals (GPA, degree requirements, good writing, methods awareness, etc.). Meanwhile, digital methods can seem more able at traversing hard boundaries, are very proudly multi-disciplinary, have a naturally broader audience, and can be openly risky – all of which amount to a far more organic and experimental system of assessment and achievement. Reconciling these philosophies is happening, albeit slowly. To make this faster – which I believe would be to the benefit of all – I suggest we need to move away from a focus on the digital, and away from the historical profession. Rather, we need to shift the ideas of what modality really means to historical scholarship and the sustainability of the profession in a world increasingly characterized by the rapidity of information delivery and ephemeral concentration. Enter David Pye. David Pye contends that in essence, design is failure. Predetermined by economy, it mitigates chance, ultimately elevating risk as the most genuine index of craftsmanship. Though speaking as an artist and wood-turner, these ideas have exciting implications for how digital projects and the history profession might better shape their relationship to further the mutual advantages for everyone. By reconsidering the modes through which we generate knowledge – institutional, editorial, bureaucratic, and so forth towards modes to which digital history naturally lends itself such as interactivity, simulations, modeling – we can get closer to finding new indices of achievement. What would history projects look like if we assessed innovation not necessarily on what others have written before, but on their usefulness to other disciplines? What if we evaluated history work on interactivity, rather than design and structure? How would students engage with history assignments if they knew those assignments were a long-term project used in their subsequent classes? What might “disposable history projects” look like? These questions undoubtedly raise dystopian images of historical anarchy, but this is not the future I imagine (nor want! ), and not the point I wish to make. Right now, we do reward innovation, praise inclusive research, and develop our teaching – as that’s how it should be. But, these work within a larger system which can also embed standardized design, maintain blanket standards, and contour possibilities sometimes as limiting as they are progressive. Reaching beyond this conformity is tricky, but if we can shift further away from these paradigms, in favor of greater risk and greater shared authority, the craft of history will likely become something more responsive to society’s broader changes, less fortified overall, and much more prominent and beneficial in our everyday collective consciousness. Digital methods provide a highly accessible and exciting foundation for developing new assessment criteria focused on risk and experimentation, and they do so without any permanent penalty to our established scholarly processes. Graphic design software and 3D printing make producing and modifying educational board games realistic, virtual reality gets us closer to immersive historic learning than ever before, and web design allows us to reach audiences university presses and academic journals can’t. Integrating these ideas does require sharing authority and inviting outside expertise, but this ground is already well covered by public historians and is a working example that it’s possible. New connections – between history and computer science for example – can thus attract new audiences and likely raise enrollment too. If those students and collaborators can take those ideas and work them into their own research and/or career goals, then we all stand to better identify, redefine, and manage the negotiated boundaries between history, the public, knowledge, and democracy. The 3D model of “Lesley” printed at the Temple University DSC, 2017. Image Temple University, 2017. Moreover, if we see the inclusion of risk as an index of project quality and pedagogical effectiveness, and we can develop that index across all colleges, departments, and disciplines (just as interdisciplinarity has flourished), then we’ll be better equipped to understand how to restructure degree programs from designs which generally promote sequential learning and reproductive curricula, to less structured and more exploratory experiences where knowledge accumulation and production follows a more varied, less contiguous path and mode. It might seem rather cavalier to promote risk, but doing so isn’t the funeral oration of our existing designs. Just as the material and the digital are coupled so fluently by photogrammetry, could they not be used together to tackle the hurdles and obstacles of historical work? It would be foolish to ignore that inserting risk as a hallmark will create uncertainty, but uncertainty is thrilling, unpredictable, and best of all, exciting. If more can know about those values, then not only can history education further engage with the society-focused participation which many public historians work at everyday, but digital methods can be become a consistently integrated feature of historical pedagogy. If Marc Bloch was right, and history is a craft, then maybe David Pye has more to say than we might have thought.